Today’s visits included trips to historic sites and to two well known Peruvian ceramicists – both folk artists. Our first stop was to the Historical Sanctum of the Pampa of Ayacucho. This memorial was constructed in the late 1970s to commemorate the battle Dec.9, 1824 which won Peru independence from the Spaniards – the last country in South America to do so. On our way to the locale we made an impromptu stop in a wild grove of prickly pears – to taste the fruit and to capture some cochineal insects! This is where the dye cochineal – a deep red colour – originates. When you squish the bugs you get a substantial squirt of red liquid from each. Our first pottery stop was to Sr. Limaco – who explained how he creates his pottery sculptures while making a small pottery piece of a musician. His work has a contemporary political flavour – this nativity has the child Jesus in chains, the wise men with guns and grenades representing the difficult period in the region’s recent history with the terror brought about by the Shining Path. 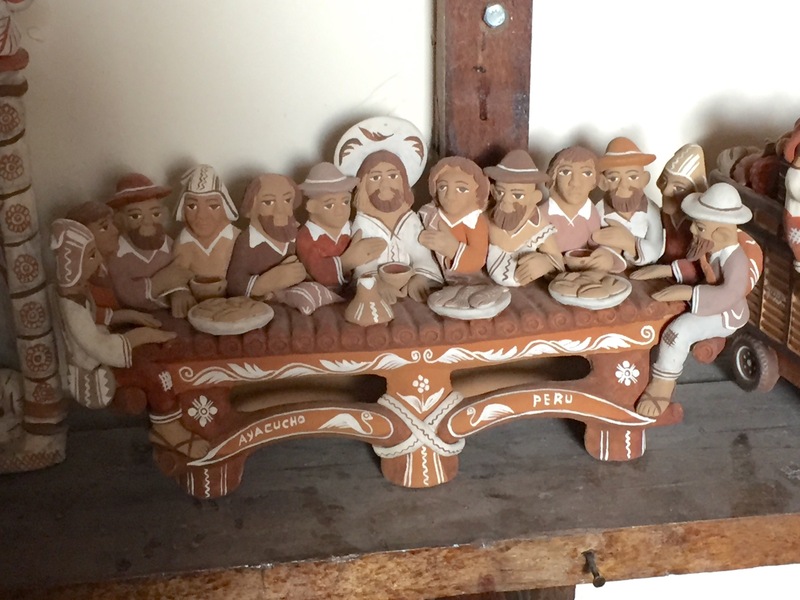 Our second visit was to the workshop of Mamerto Sanches – his work is also folk art in character with much of his sculpture having a religious connection – this piece below a rendition of the last supper. 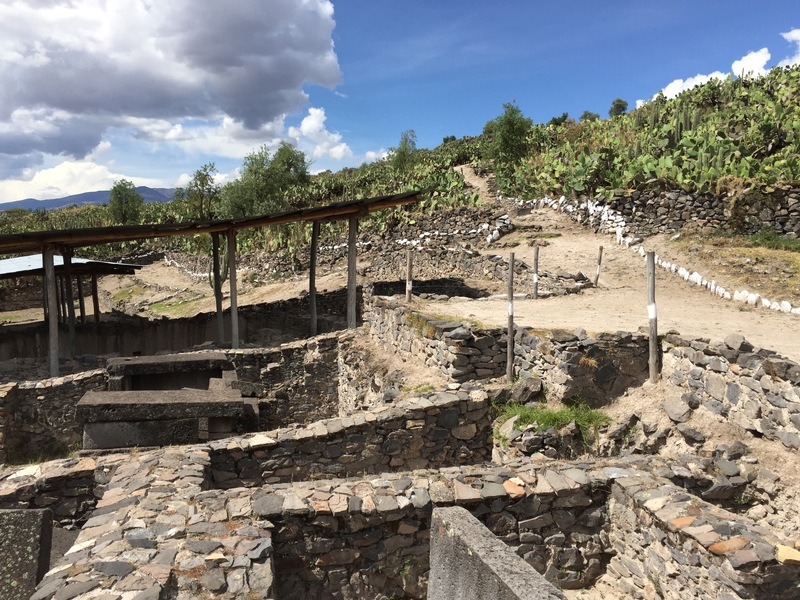 Our last stop was the Cheqo-Wari archeological site – pre Incan, this site was the locale of the Wari capital city. This portion of the site was the location of the tombs in which the aristocracy were buried, sometimes at more than one level. The tombs included large, flat rocks obviously quarried from volcanic basalt at some distance from the site and brought there – the mystery is how these large cut rocks were moved since there is no evidence these pre-Incan people understood the wheel (or round logs) for moving large, heavy objects. Homes, shops, apartments in Peru are unlike buildings I’ve experienced anywhere else in the world. From what I can tell almost all construction is brick (traditionally adobe, and again more recently adobe) and mortar with a stucco finish sometimes. There are two reasons for the thick walls – they keep the heat out during the day, and then they release that heat during the night. In the cities/towns much of the building is unfinished – that’s because people have to pay taxes on finished construction so it’s not uncommon to see rebar sticking up beyond the first or second story, indicating the job is yet to be completed. This is the street where Maximo’s workshop is located – on the left just as the pavement ends. There are cell towers everywhere with good wifi reception (if you have a contract with a mobile provider). The buildings, however, are still under construction. We saw lots of buildings like those above on our drive from Lima to Paracas – these considerably more finished than most. The parts of Huaytara we could see looked well kept up – painted, finished with roofs – although a lot of rural construction affords little more than very basic shelter. Miraflores, an affluent part of Lima, consists mainly of high rise condo and rental units. But many streets also had units (I don’t think many of them were single family houses) and they are much less prosperous looking. The closest we’ve come to wealthy abodes were the beach houses on the bay in Paracas. Owned mainly by people from Lima (I was told), used as get away locations (a 4+ hour drive from Lima), these looked like affluent homes you’d find in many other places in the world.